0.8 grams of protein per kg of body weight is the standard recommendation for non-athletes. 1.1 grams per kg is recommended for endurance athletes. 1.3 grams per kg is recommended for strength athletes. A 220 pound strength trainer requires 130 grams of protein per day, whereas a 110 pound strength trainer would need only 65. A 220 pound endurance athlete would need 110 grams of protein per day, whereas a 110 pound endurance athlete would need only 55. A 220 pound non-athlete would require 80 grams of protein per day, and a 110 pound non-athlete would need to consume only 40 grams of protein per day. To put this into perspective, the average American (when not dieting) consumes 1.6 grams of protein per kg of body weight each day. A bit of extra protein is unlikely to do any harm (many of the risks associated with high-protein diets only affect those with particular health issues or vulnerabilities), but it won’t do any good either, and could displace foods that will benefit your health – fruits, vegetables, and complex (healthy) carbohydrates – as well as causing you to gain weight. The body is not very efficient at turning protein into fat, so you’d need to eat a very high-calorie, high-protein diet to get fat from excess protein consumption. 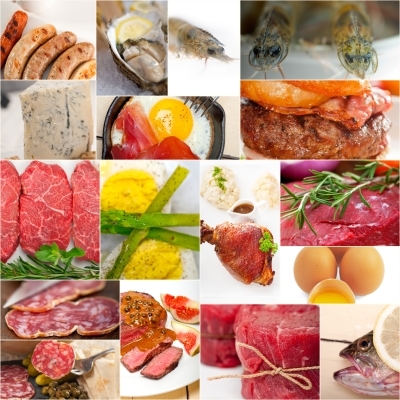 However, with the Paleo diet trend and myths about megadose protein requirements for muscle building, many people do eat far too much protein. Another thing athletes should keep in mind is that a diet deficient in carbohydrates, which are its preferred fuel source, will turn to protein to meet its energy requirements, which can result in a loss of lean muscle, particularly for those who also do cardio exercise (and especially for endurance athletes). While cutting down on or even eliminating processed carbohydrates (junk food) is a good idea, very low-carb diets are detrimental to strength and fitness for most people. Not only do they provide insufficient fuel for cardio exercise, but they have been shown to reduce strength training performance as well (Leveritt et al., 1999, Effects of Carbohydrate Restriction on Strength Performance, The Journal of Strength & Conditioning Research, 13, 52-57). For more food articles, see the main Food and Nutrition page. For articles on strength training and other forms of exercise, see the main Fitness page. For articles on health, see the main Mind-Body Health page.